I was goofing around on social media the other night, conversing with someone and recollecting our fondness for our Salton yogurt makers from the 70s; bright yellow contraptions that you put white-capped jars that you’ve filled with milk and yogurt into, plugged into the wall, and waited overnight. Then, in the morning, you were magically rewarded with five pots of warm, barely quivering, just-made yogurt. It was all so exciting at first and I couldn’t stop myself from making yogurt. But like most things teenagers get interested in, I eventually lost interest in it, most likely tempted by the rainbow of flavors at the supermarket, which was highly sweetened and was accompanied by a pretty brilliant ad campaign. And I switched to those. It wasn’t until I became a mature adult – although some say they’re still waiting for that day to happen – so I’ll say…it wasn’t until I moved to France that I developed an appreciation for plain, unsweetened whole milk yogurt. The yogurt aisle in a French supermarket is, indeed, a sight to behold, with rows upon rows of yogurt and dairy items in all sorts of colors, flavors (including chocolate, caramel, cheesecake, and lemon macaron), fruits, fat percentages, and lord knows what else. Lately I’ve been using a lot of plain yogurt and in a recent post for Labneh, a reader rightly pointed out that I should be making my own. But since I DIY (do-it-yourself) on a number of other things, such as aging my own cocktails and brewing my own coffee every morning from scratch, I was okay with letting someone else make my yogurt for me. Then again, coming from a place where even the simplest task can be complicated (or I was trying to capture a portion of my lost youth) I gave in and picked up a bottle of milk and decided to make a batch again. I now have a full quart of plain yogurt and I couldn’t be happier. I suspect some will be drained and made into Labneh and since there are strawberries showing up at the market, there may be some Strawberry Frozen Yogurt in my future. But for now, I’m enjoying it with some granola and jam. And a spoonful of nostalgia. 1. Clean a 1 quart (1 l) jar by pouring boiling water in it and letting it stand 5 minutes. Drain the water (carefully, as the water and the jar will be hot), and let the jar dry. 2. Heat the milk in a saucepan fitted with a thermometer, or use an instant read thermometer, until the milk reaches 180ºF (82ºC). Remove from heat. 3. When the temperature drops to 115ºF (45ºC), stir in the 1/4 cup of yogurt, then pour the mixture into the jar and cover it. 4. Put the yogurt in a slightly warm place, and leave it undisturbed for 10 to 12 hours. The longer fermentation will yield a more tart yogurt. An oven that has a pilot light, is good. I have radiant heat (under-floor* heat) and put it in a warm spot. 5. Chill the yogurt thoroughly, at least three hours. The yogurt will thicken up once cool. *For those concerned that I am putting it on the floor, I make sure there is a protective layer of glass between the yogurt and the floor. I make my own yogurt all the time – using an insulated cooler. While the milk is heating up, I fill the cooler (jar-neck height – you’ll have to put water-filled jars in while filling so when you put the yogurt jars in the water won’t go over the tops of the yogurt jars) with hot water from the tap and close it to keep the heat in. I leave the yogurt in the cooler overnight & in the morning – Ta Da! It’s yogurt! I made yoghurt just this way in a thermos when I was a teenager as a science experiment, and using powdered starter in a special (non-powered) yoghurt maker about 10 years ago, but I haven’t made it since. I think I may try this method with some of the organic and local milk and yoghurt from the organic co-op I volunteer at. I think my daughter may love this, and she might actually eat some, especially if I can find some blueberries to go with it for her. Can I increase the fat content of the yogurt by replacing half the milk with 35% cream? how do i stop it from forming a skin? thank you! hope to make my own yogurt soon. Awesome! I didn’t know it could be made at home so easily. Definitely saving this! I have a regular non-gas oven. The oven light is sufficient to keep the milk mixture warm enough for it to thicken. Cover the jar/jars/bowl in a thick towel or two, turn the oven light on, and let it sit for about 12 hours. It works great! I thought about buying a yoghurt maker on and off, but now it seems like one of those kitchen aids that can easily be substituted by my already owned pots and jars. I was just thinking about starting to make yogurt, so this post was perfect timing! We have an EasiYo yogurt maker which is good, but you have to buy sachets of powder to make up the yogurt which are quite expensive, so I’ll definitely be trying this recipe! Hi Kezia, you don’t have to use the EasiYo sachets- just follow Davids’ recipe using the EasiYo container then pack it into EasiYo thermos as usual but use just warm not boiling water in the chamber. I forgot to mention that I use full-fat milk, and as a starter I use yogurt from the previous batch. The only time you need to purchase a starter is the first time you make it. And to make Greek-style yogurt, let the yogurt drain by placing it in cheesecloth or a clean kitchen towel, and suspend the bundle over a bowl to drain the whey. The drained yogurt is very thick and creamy. I am so interested in making home made produce. I am wondering would the process work with soy alternatives or other animal milk? I grew up on a dairy farm, and as a teenager, made many batches of yogourt from whole, raw milk; it’s taste was unlike anything available commercially, so absolutely creamy and delicious. I no longer have access to ‘straight from the cow’ milk so I don’t bother to make yogourt anymore. I used to make it in a heavy clay casserole meant for slow cooking baked beans, all wrapped up in a big towel. It kept the heat in and allowed the yogourt to cool very slowly overnight. Perfect yogourt every time. Extra delicious with my Mom’s homemade jam stirred into it. I use an insulated lunch box or beer six pack box which kees it warm enough overnight. I make yogurt like this every week. I use basic whole milk and I even use yogurt from a previous batch to make the fresh batch. It is awesome! Ah, the old Salton yogurt maker! I dug around in the dark corner of the garage that holds my “elephant’s graveyard” of appliances that have long since fallen from favor and, low and behold, there it was! However, years of dust and grime would prevent me from dragging it out. Especially when you have such a simple recipe right here in front of me. Agree with the comment about that an oven light will give enough warmth to make this recipe. What a great idea! Thanks. The first time I had unsweetened yogurt was at a boarding school run by French nuns. The yogurt was served in glass jars and was lovely and tart. It was made from milk from the cows grazing on the school’s land. I didn’t know how to eat it , as I had only been used to fruity yogurts, like Danone, but watched my fellow students pour sugar onto the pots and dig in. Now I like my plain yogurt with fruit and honey, and often with bircher muesli to which I add lemon juice and nuts. I too use a small cooler. I put the milk mixture in 8 or 12 oz jars and pour boiling water into one more jar placed in the center. Seal up the cooler and voila! In the morning you have yogurt. I use a cooler as well – the way I’ve learned is to pour the milk into jars, put the lids on , place them in a small cooler and then fill the cooler up to the height of the jars with hot water (as hot as the tap will go). Then close the cooler, wrap in a blanket and let it set for 6-8 hours. Comes out lovely and warm. I always strain mine into Greek yogurt – it’s divine. One of the best tasting homemade yogurt that I had came from a starter my bro gave me. He acquired it from his officemate who bought it all the way from India. I ran into the same dilemma as Paula mentioned. Now that I ran out of it, I can’t make myself eat store-bought yogurt anymore. Hi David- I’m having trouble with the links at the bottom of the post, after the notes. Is it me? Would this work like a sourdough starter? In other words could I take my last 1/4 of homemade yogurt and use it to start my next batch? David, I had so many instances where the yogurt would not take that I stopped making my own. I recently found the Sant Benoit brand at Whole Foods, and nothing reminds me more of the yogurt we used to make straight from farm milk. Your post reminded me of how easy this is… My favorite way of eating it is to put it in a bowl and drop a tablespoon of Creme de Marrons Faugier in the center. Then I eat away at the creme de marrons with spoonfuls of rich, tangy yogurt. Will try making my own tonight… Thank you for the post! If you have a recipe for the Creme de Marrons which is almost impossible to find here, please be kind enough to post it. I still remember the tubes that we used to take on Girl Scout trips… You bring back so many fantastic memories… Thank you! Please….if you want to make labneh & tsatsiki etc etc you need SHEEPS milk. I know you can get this in Paris…. I love sheep’s milk (and fresh goat milk) – where can I get it in Paris?! I too use whole milk (not ultra pasteurized if I can find it) for my homemade yogurt. Instead of trying to find a warm place to culture, I use a Saltom YM9 1-qt yogurt maker. I tossed out the plastic quart insert andinstead use a wide mouth glass quart jar. Works to perfection! Making yogurt with raw milk is even simpler. 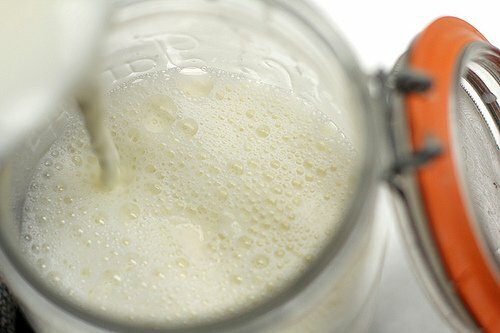 Using clean quart jars, put a few ounces of yogurt (your own or a good commercial plain full milk) and fill it to the top with raw milk, cover it and put in in the pilot-lit oven. If you leave it for 30 hours, it is more thoroughly pre-biotic. That’s all. Then transfer it to the refrigerator for a few hours. No heating the milk, no sterilizing, no praying. David, when you say “brewing my own coffee every morning from scratch”, what exactly do you mean? I miss “Seattle” roasted coffee. There is Starbucks in Paris, but not here in the middle of the country, and Starbucks in France doesn’t do online ordering. Any thoughts? David – Ah, yes … the Salton wonder machine. Got us all eating yogurt back in the day. Actually, I learned to make yogurt from a friends mother who is Persian. It was so simple and foolproof! But the lure of those cute jars was not to be denied. You’ve got me thinking of making some of my own again – perhaps out of goats milk. 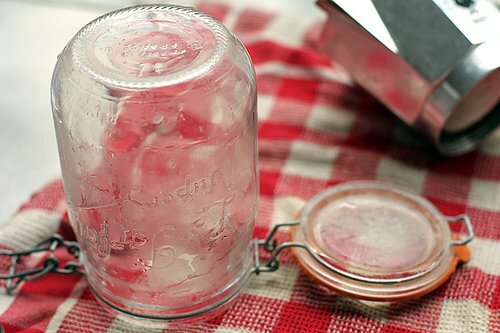 Here’s a tip – regarding the sterilization of the jars – from my experience making confiture: Put your jars on a half sheet and in the oven. 215 degrees f, until you need them. They’ll be warm and dry. Turn off the oven when you retrieve your jars, and leave the door ajar, allowing the oven to cool somewhat. Then pop your filled jars back into the still warm oven and proceed as in your recipe. This has me intrigued. We go through ridiculous amounts of yogurt and I could easily do this every evening. I wonder if the ‘proof’ setting on my oven would be too warm? That’s a great tip re: sterilization, Cynthia. I’ve been running hot water into my jars for a few minutes with a touch of dish soap, but that’s much better! You forgot …. line a wire strainer with two layers of clean paper towel, dump in the yogurt, put on a pot in fridge for 4 – 5 hours to let the whey drain out and you have a Greek yogurt. INFINITELY superior in taste and texture to plain yogurt. Don’t worry, the yogurt will not stick to the towel. Ah yes, the Salton, I had it, too. Then I found Fage, but now I’ll try this recipe…love the simplicity…can’t wait – will start with 2% milk. Thanks! I also use a little 6 pack ice chest filled with hot water from the tap after seeing it suggested by Harold McGee. He didn’t mention sterilizing the jar and so I don’t. He said it would be ready after 4 hours and it is. Also his recipe said to use 2 tablespoons of yogurt per quart of milk which is better for people like me who want to eat as much of each batch as possible. I have been keeping the same culture going for 2 1/2 years after I found some fantastic farm made yogurt while visiting my son in Washington DC. When I go on vacation I freeze a small amount so I can make it again when I get home. Joel L. – It’s worth noting that that initial heating step is not only to kill any undesirable spoilage organisms you might not want to cultivate, but it is also very important to the subsequent gel structure of the yogurt. The heat changes the shape of the milk proteins so that they can better hold onto the whey in the final product and reduce syneresis. If you want the benefit of raw milk, drink some raw milk with your fresh yogurt. Whole milk powder will reduce syneresis but I never use it – if you don’t like the whey that forms on the surface you can just pour it off. I’ve also found that using each batch of yogurt as a starter for the following batch won’t work past the first few times. There are a number of variables to control for that change the lactic acid bacteria population ratios and you’ll end up with off-tasting yogurt eventually. Mine tasted like socks, which is great if you’re into that sort of thing. I am not. 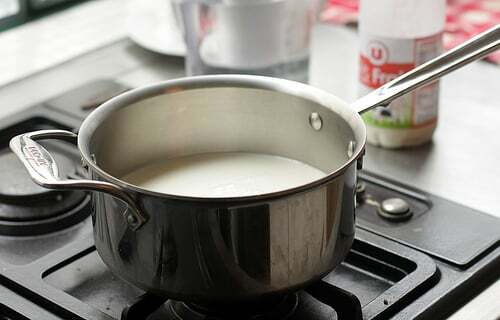 It also helps to add a little bit of the cooled milk to the starter yogurt in a separate small bowl while whisking, then adding that back to the pot of milk so that the bacteria are brought up to temperature slowly. I incubate at 40ºC for 8 hours and that’s usually enough. It’s also important to not jostle the jars too much during that first 8 or so hours. This can break the gel structure and stop it from setting up properly. Having said all of this, yogurt’s pretty hard to eff up. I’m just…I’m just really passionate about yogurt. I’ll go now. I have been making yogurt for several years, but frequently the results were somewhat curdled and watery. I then happened upon this method for a custard-style yogurt that gives me a thick, smooth product every time. The key is keeping it at boiling temperature for 10 minutes. I do a crossword while stirring to make it a bit less tedious. I put some jars of hot water in a cooler, then add jars of incubating yogurt and leave them overnight. This method has never failed me. A few times I’ve made quark, too, which is like a milder labneh and is also very easy. Ashley England’s book on dairy and cheeses explains all the steps in making different cultured dairy products very clearly, although I’m not at the stage of making my own camembert. I’ve also used lowfat milk ith no problem although letting it incubate a bit longer helps with the thickness and creaminess factor. Thanks for another fun, and funny, post. I was especially glad to learn of the protective layer of glass between the yogurt and the floor. Wait, Claire! Come back! I get a kind of weird, stringy quality to my 30 hour unheated unheated yogurt. It’s a lot like you get with natto, that fermented soy bean concoction the Japanese eat for its health benefits. A definite “eww”, but it charms after a while and doesn’t effect the taste. Joel L. – Ropiness is likely caused by exopolysaccharides secreted by Streptococcus thermophilus. The main cultures used in yogurt (though there are a range of others often added to commercial yogurt for probiotic or other purposes) are S. thermophilus and Lactobacillus bulgaricus. S. therm prefers to grow at a lower incubation temperature (35-42*C), while L. bulg prefers slightly higher (43-46*C). Of course they’ll both grow within either of those ranges, but one will grow faster if it’s within its preferred range. A slightly higher incubation temp will probably reduce the amount of exopolysaccharide you’re getting, though it is harmless and even desirable in terms of texture in small quantities (adds body, not enough to get stringy). Some companies isolate it and use it in non-fat yogurt to mimic the mouthfeel of a full fat yogurt. Hope that helps! Thank you for the Salton yogurt machine flashback! I was instantly transported to my childhood home kitchen (in burnt orange, antique gold and avocado hues) to recall my mother’s feverish efforts at health and making what at the time I felt was ‘gross’ plain yogurt. Fast forward to now and I purchased a Donvier yogurt maker a few years ago which is sitting dormant in the pantry of my NOT burnt orange, antique gold and avocado kitchen. As we migrate toward summer foods, this is a great prompt to pull that baby out and start making yogurt. Thank you. Is plain yogurt really starting to become obsolete in grocery stores in France? I find that sad… good yogurt has always been something I have associated with French food. When I moved to Germany I really got into yogurt, plain yogurt specifically, because it’s just so good, and everywhere. Sure, we have a million flavors as well- things like straciatella, chocolate, coffee – and they come in these awesome jars that make you think it’s almost homemade – but I’m thinking (hoping) plain yogurt will always rule in Germany. Found bringing temp down to 110 F insures i won’t kill the culture. Also you can ferment in the cooking pot. cool milk down to 110 F from 185 F, slowly stir in the culture, cover, put pot on a heating pad set to medium, cover all with a few dish towels and wait 8-10 hours. remove lid and whisk yogurt thoroughly and then pour into jars. put in fridge to let the yogurt “set” i can make a gallon this way and have enough to have strained and regular. use 3 Tbs of yogurt for every 1/2 gallon of milk. (too much yogurt added and the bacteria starve and the batch fails.) this method has not failed me yet! Some of the ‘natural’ brands in health food stores are sold in pint containers in France (and, less-rarely, in supermarkets), although you can get fromage blanc and crème fraîche in pint-sized containers in most supermarkets (which, come to think of it .. is interesting that yogurt is something mostly sold in small plastic containers. I did see something once on tv that was advising people to buy things like yogurt in larger containers in France, because of all the plastic those small containers used, but not sure what became of it. After reading your post on Labneh i went and ordered my new yogurt maker on Amazon!!!! What could be better! Found great natural milk just waiting in my fridge for the maker to arrive tomorrow and a bag of sweet peaches to slice on top! See, we were both inspired! I heat my milk (1/2 gal) sometimes with added cream in a large heavy saucepan to low boil, cool for 20 to 30 mins and add the yogurt starter (purchased plain full fat ) that I have premixed with a small amount of milk. Just drag a spoon through the center of the kettle and pour it in do not stir. Leave skin alone. Then I put it in my oven with the light on for 16 hours take out and put in large strainer that I have lined with a very old tea towel. Drain for a few hours and pour into bowl to keep in refrig. Perfect greek yogurt in one pot. No measuring, no thermometer not many dirty dishes. The hardest part is finding plain full fat yogurt in the stores for the starter. Here in upstate New York (The Hudson Valley actually) we are lucky to have at least 3 local dairies that produce quarts of wonderful ORGANIC whole milk yogurt (from sheep or cows) easily found in the local co-ops & farm stores. However, I remember, before yogurt was a household word in this part of the country, we did have the yellow Salton with the little individual cups. But our favorite yogurt maker was a large aluminum plug in pot (I wonder what became of it?) that held 3 or 4 of our own quart jars and kept the temp exactly right. For the original batch we used Bulgarian Yogurt Culture found at the health food store & saved a half cup or so for each subsequent batch. Those were the days!! Next time you’re in the States and near a Trader Joe’s, French Village Cream Line Yogurt is amazing – just whole milk and active live cultures – that’s it! I live in France and love you blog. Could you tell me how to identify thst yogurt is live here (vivsnte?). Having a bunch of kids, I never have time to myself. Looking at food blogs is my escape. I follow you and John Contratti’s “Cooking With Mr. C.” You two guys are a life saver. I like today’s yogurt. Judy Gee – where do you find this yogurt upstate. I have a weekend home in the Caskills and would like to locate this. Can you share the info? I hope you see this – not sure how to contact you. David do you have any suggestions? Oh, Claire, a plethora of riches! Since I’m determined to use the raw milk I can get with a 35 minute drive (illegal here but not in Pennsylvania), I don’t want to heat it. That’s why I’ve evolved this dodgy method. I’m not concerned only with the cultures I’d be altering but the other things we don’t even know about which are in milk in its raw state, and the yogurt I get is sublimely delicate in texture and flavor. The yogurt I make this way is so rich and creamy, I’ve been easily living with the ropiness (I didn’t know that was the word for the consistency). But I’m swayed by your suggestions; I’ll give it a try. If I warm the jars to 215° (F, as Cynthia (above) suggests), is that enough to avoid warming the milk, or do I still need to get it to 40° (C)? For how long? I have been making my own yoghurt for around 1.5 years now. My culture is 1 year and 4 months old and just keeps going. If you keep the yoghurt ‘alive’ you can keep using the same culture as it shouldn’t die. It is alive! Anyway, here is how I do it. I find the stove top method too time consuming. If you have Indian friends, talk to them about starters. I use the starter given me by an Indian friend, and I expect it to go on working for a lifetime. Previously, I used various natural and bio store yogurts as starters, because after 2 or 3 batches, my own was less effective. My friend, a nutritionist, has explained to me that in Europe store yogurt is generally made with only 2 types of culture. Her culture from India has about 70 – 100 different types, and is therefore more robust. Ronneybrook Farm yogurt, Hawthorne Valley yogurt, Old Chatham Sheepherding Company (sheep’s milk) yogurt. I’m not familiar with the shops in your area, but over here we find them at The Chatham Real Food co-op Market, the Hawthorne Valley Farm Store, Samascott’s (Kinderhook) & probably several small gourmet-type shops in Hudson (nearer to you.) I’m surprised there isn’t a place in Catskill that carries one or all. PS If you’re a weekender, can’t you find good yogurt near your first home? Still using the Salton pots here…and also have a Moulinex pots maker and a big tub 1 litre yoghurt maker! We use raw milk but heat to 70c and stir constantly to avoid skin. I use a natural Greek Yoghurt as a starter and add a bit of organic full milk powder to achieve that lovely stand your spoon up texture. The only thing with raw milk is that I need to use a commercial starter every time as the lovely microbes in the milk aren’t stable re thickening. Love yoghurt : ) Looking forward to exploring French yoghurts for a month in November…great post. Hello David – I have been making yoghurt for a couple of years. Every couple of makes I use bought yoghurt for the starter( makes better taste.). Being thrifty I freeze the remainder in ice cube tray and it works very well. Just make sure you bring the cubes back to room temperature before adding to the cooled milk. Enjoy your blog and life in Paris very much. I make my own yogurt every week as I live in a remote area of Indonesia and cannot buy yogurt here. I use powdered whole milk to make my yogurt and don’t even have to heat/cool the milk. I just mix 1 part boiling water with 2 parts room temperature water, and then 1 1/2 parts powdered milk. I add some of my yogurt from the previous batch and then let it set in an insulated cooler. Sometimes I also add in a can of sweetened condensed milk with the mixture for a sweet yogurt. SO easy and it is better than any American commercial yogurt I have tried. Odd coincidence! I have just been wishing I had held onto my old Salton yogurt maker too. And exactly because of the dearth of whole milk yogurt here in Los Angeles. In the past when I made yogurt I found that it had a natural sweetness when made from powdered culture. Once my yogurt was made I could use that as the starter for subsequent batches as your recipe suggests but the tartness developed as soon as I began making yogurt with yogurt instead of the powdered culture. Each subsequent batch got a bit more tart still. I’m not concerned you put your yoghurt on the floor, I’m just envious of your underfloor heating. We are lucky enough to have the Yoghurt Of The Gods available in New Zealand (Cyclops Organic), which is unimprovable upon, so I will resist the lure of making my own. It would be a very different matter if “normal” commercial yoghurt was all that was available, though. Thanks for the article and the recipe, I can’t wait to try it. I wonder how it would compare to the absolutely amazing homemade yoghurt I had in Milos, Greece? If you ever get a chance to compare, I highly recommend the Psarvolada Resort in Milos – the best food we had during our two weeks in Greece! 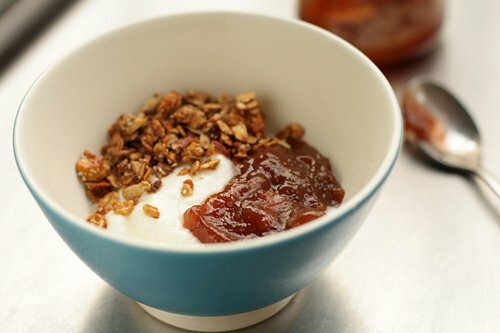 My favorite way to eat plain yogurt is with a big spoonful of honey – I drizzle it over the top, without stirring it in, then spoon up the yogurt with the honey coated spoon, getting just a bit more honey with each mouthful. So delicious. And it was my French best friend in high school who introduced me to it. Also, for a dairy free version, this works with coconut milk – I’ve done it many times! I love making my own yogurt! Because a stomach virus caused me to become intolerant to milk products, I now make my own (virtually) lactose free yogurt by fermenting it for 24 hours. It does not come out too tart and is some of the best yogurt I have tasted. Most importantly though, I can eat it! Do any of you experienced yoghurt-makers use a microwave to heat the milk with good results? Thank you so much for the timely post. I have just gotten back into making yogurt after a friend gave me a vintage West Bend 1 quart yogurt maker with the $0.25 yard sale sticker still attached. For years I didn’t know about the importance of heating the milk to 180 degrees. It is definitely key! Now my yogurt is above and beyond anything from the store, due to fresh milk from another friend’s 6 Jersey cows. All the plain yogurts found in stores for starter are not created equal. After being disappointed with Stonyfield, I switched to 3 Greek Gods and couldn’t be happier. One bacteria in particular, L. Bulgaricus, makes for an especially sweet and mild yogurt which I prefer. Check your labels and happy fermenting! Congratulations. Homemade yogurt is special. At least for my family. I heat the milk to 200 F and mantain it on the stove with the simmer setting on the flame for 10 minutes. Then cool it to 115 F and place it into containers and keep the temperature to 111 F for 2 to3 hours to set and to develop a low acidity. I happen to own a bread proofer box so maintaining temperatures is not a problem. I make mine with 1 cup of skim milk powder to a litre of full cream milk. Makes a beautiful thick Greek-type yoghurt. There is also no need to do the pasteurisation step (heating to 82C) if your milk is already pasteurised. I just mix my milk, milk powder, and a dollop of the last batch, and put it all in my waterbath at 40°C overnight. Oven does just as well, or warm it up and put it in a wide-mouth vacuum flask. I worked somewhere where we didn’t always heat the milk – we just added the culture and let it sit. The owner of the restaurant was a food scientist as well as the owner however on occasion, it didn’t turn out and we’d end up with big jars of runny yogurt. So heating it apparently is just an added measure of security. On my last trip to New Zealand, I discovered the EasiYo yogurt maker. What a life saver since I go through a quart of yogurt a week. This handy little yogurt maker comes with packets to make all types of fruity yogurt ($5 each once initial supply is gone), but being the simplistic person that I am and love plain unsweetened yogurt, I found a recipe on the internet and make my own without use of packets. Nothing like a wonderful bowl of yogurt to start the day. Just like Mom made us back in the 60’s with that Salton yogurt maker. I live in India, and making yoghurt here in the tropical weather is breeze. We just have to take lukewarm milk, mix in a teaspoon of yoghurt, and leave it overnight (6 to 8 hours). I am so thankful that making yoghurt does not take so many steps. I want to like yogurt because they say it’s so healthy, I really do, but I just can’t get past the tangy acidity of it. Can you add some sugar to the mixture to sweeten it when you make it? In all likelihood, you probably can (that’s just a guess, since you can buy yogurt pre-sweetened and I assume they ferment it in the containers). Regarding the “healthy” issues, of course yogurt is full of calcium and a few other good things, but they say if you really want to get benefits from yogurt, you should eat yogurt with bifidus in it, which is supposed to be quite beneficial for various health reasons. Susan – I make about 2 L of yogurt at a time, and I add a can of sweetened condensed milk in with the milk mixture when making the yogurt. It sets up just fine, and the yogurt is just delicious – mild and not too sweet. Wow, this is very exciting, I would love to make this with goat’s or sheep’s milk for my son who’s allergic to cow. I have to stop throwing my money at Monoprix so would be amazing to do something for myself! I just looked at the previous posts – it looks like I can just use milk powder with the EasiYo maker, I wonder if it is anything like Greek yoghurt if you use Greek yoghurt as a starter? Your post arrived at the best time… I just returned from Manila where we were making our own yogurt at my aunt’s and I wanted to do the same here in SF. I looked into buying an EasiYo yogurt maker, but your post convinced me to try your method first. Thanks, David! “I spent a sleepless night while this batch of yogurt fermented, worrying that I didn’t use milk from the natural food store.” God, if this is a sort of a problem that keeps you up at night, I want to have your stress-free life. Thanks for this great post. I have been making my own yogurt for years using a Yogotherm which is a 2 L heavy-duty plastic yogurt container inside an insulated container. It’s essentially a purpose-built thermos. No electricity required. 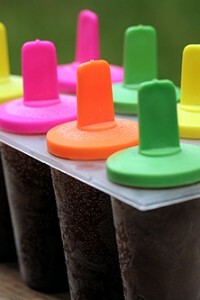 I remember them being around in the 70s when I was a kid and then I bought my own about 15 years ago. The design has changed somewhat (uglier now, natch), but they work beautifully. Whole milk works best, tastes best and is easiest. Joel L., you can also get that stringiness if your starter has additions like pectin (and surprising numbers do.) That’s why I only used freeze dried starters, myself. I haven’t found any commercial yogurts in the US that I like the taste of or the results, except for Mountain High, but that’s not available on the east coast where we live now. My homemade yogurt is the reason my kids and husband can digest any dairy, so it’s not optional at our house. (We learned that when we lived in Paris in the 13e. He was so glad to not miss out on French cheese!) I use a 2 quart yogurt maker (Eurocuisine) because we go through a lot. I also use a lamp timer on it to make sure it shuts off after 8 hours so it doesn’t get too tart. And David, I, too, preferred yaourt nature brassé. Some fromagers will have it, too. There was one at the marché Auguste Blanqui right near our apartment. She also had an amazing butter, and would save me some each week. She started doing it after I got upset when her husband tried to give me the “unspecial” butter. ;) She even offered to mail it to me in the US when we moved home. Sigh, elle me manque, la France. Funny, I’ve been reading this post while eating my homemade yogurt for breakfast (with blackberries and homemade granola)! A few years ago I decided to try making my own yogurt again, and bought a Salton yogurt maker on eBay — because I had given away my original one years ago after it sat and gathered dust. The results were okay, but not consistent. Then, I found Maureen’s recipe and method for yogurt and labneh on Rose Water & Orange Blossoms, and hit the jackpot. The key for me is to drain the yogurt for a couple of hours before putting it into my yogurt jars, to get it more like Greek yogurt consistency. No comparison to store bought, and there are a couple of dairies nearby where I can get excellent, fresh milk. Wow I had no idea how incredibly simple it was to make homemade yogurt. That’s something I’m going to have to try now! 90+ comments and not one from an Indian? (aside from Annie’s comment about making yogurt in India). I’ll get us started then. I love, love, love this blog and am a huge fan of anything David Lebovitz, but I am always hugely amused by the hoopla over “homemade” yogurt. Making yogurt is a nightly routine here in this subcontinent of a billion-and-counting, which I’m frankly glad to catch a break from every now and again. In Houston we used culture from regular plain store yogurt; worked just fine. Swaddling worked ok–but sticking it in the oven with the light on worked better. There’re stories to be told of folks who smuggle yogurt culture from India in, but the stuff from a tub worked just as well, like I said. Sterilize jars? Measure temperatures with thermometers? Seriously–you really can’t go far wrong even if you’re not super scientific in approaching yogurt. But maybe it’s the “Indian grand/mother” approach to cookery showing itself here: pinch of this and warm like that, and hey you know what, you’ve grown some darned fine bacterial cultures!! I have yet to buy a kitchen thermometer despite the myriad uses for one…I don’t often try to make chocolate or candy but I would love to make yogurt. Might just have to pony up and buy one for this. I always hear about how France has less strict pasteurization rules than the US – do you think that you’d get the same effect buying whole organic milk in the US, or should I add a culture? Joan — I heat the milk in the microwave, because 1) it needs no watching at all; 2) the timing is absolutely predictable; and 3) you can incubate it in the same vessel you use for heating. You’ll have to experiment a few times to get the timing right, but then you never have to watch it again. My (very old) microwave takes 18 minutes on high to heat a half-gallon of whole milk to just below boiling in a 2 qt pyrex measuring cup. If I leave the milk untouched, it will be the right temp for inoculating two hours after I put it in. To speed things up, I take it out and peel off the skin that forms as it cools. I make yogurt at least three times a week and have never had even a glimpse of a problem using the microwave. i’ve been making yogurt for 12 years, and have some observations that haven’t really been mentioned thus far: 1) the type of milk you use matters alot, i use organic Straus pasteurized but not homogenized. i think it’s a waste using raw milk cause you would kill the good bacteria in heating the milk, you should be making kefir with raw milk. 2) the culture you use matters also. i had a 4 year old culture that i liked, and then found a bulgarian culture at a do-it-yourself store and the difference was amazing. 3) my girlfriend and I go thru about 5-6 quarts a week, so I make it in a big stainless steel pot. i’m starting a very small scale yogurt business and make yogurt for that in 1 quart mason jars. the yogurt is thicker/better when made in a big pot. 4) i used to use a big le creuset pot thinking that i’d need the heat retaining qualities of cast iron, but switched to stainless because there’s alot less scorching of the milk. an oven pilot light works just fine for keeping things warm. 5) last, rinse your pot out with water before you add milk. 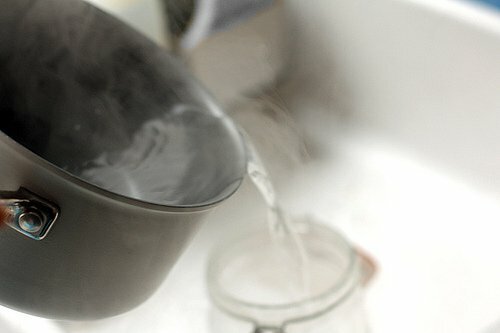 when there’s a film of water between the pot and the milk at the beginning, and you stir a couple of times, you won’t get any scorching at all. 6) i heat to 190, cool to 121, incubate for 6 hours. Folks say to rinse the pot with cold water before heating milk for that reason, but I’ve never tried it to test it out (side-by-side with another pot of heated up milk) but perhaps I should! Wow, you eat 5-6qts a week. No wonder you’ve got such good words of wisdom – thanks for adding to the discussion! 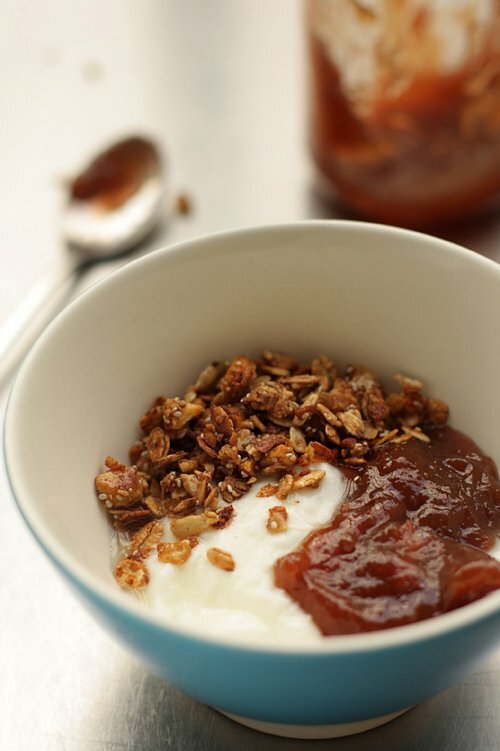 2 people eating yogurt + preserves for breakfast everyday… apricot preserves being the best. “3. When the temperature drops of 115ºF…” Do you mean when the temperature drops TO 115º? I haven’t made yogurt since I was in college (we used wooly mammoth milk then). Now you’ve inspired me to try again. What else besides healthful bacteria are in cow’s milk? That’s why I use organic, raw milk and don’t heat it up, just incubate it in the oven for a full day. the texture is a ton better if you heat it to 190, there are electron microscope pictures of milk in ‘On Food and Cooking’ by Harold McGee that explains this. Trying to think where in my house would be suitable for the overnight part of the method. Does it need to be a warm place as in warm enough to rise a bred dough? Or a bit cooler, like the sort of place warm enough to soften butter in a couple of hours? Or a bit warmer, so the jars will still be warm to the touch after standing overnight? My house is old and drafty so I might have to go with the cooler/hot water method. I recently started making my own yogurt again as well–I find that in taste it’s far superior to any commercially available brand. I am a microbiologist and thought it would be fun to take a look at what was going on in yogurt under the microscope–I posted some pretty nifty micrographs on yogurt, and other cultured foods. Check it out! I’ve read about adding a little bit of buttermilk to enhance the flavor, but I’m not sure how much or how that might affect the process. What are your buttermilk in yogurt thoughts? I’m curious if you’ve heard of this? If you have a food dehydrator, it works well! I incubate mine overnight, batching it with drying fruit or with my husband’s “raw food projects.” I just use good local additive free yogurt and good milk, that’s it. Superb texture even with lowfat ingredients. My grandmother used a wool sweater to swaddle the yogurt bowl – very effective! Kyle: I would be concerned that the buttermilk may interfere with the culture and/or the process of yogurt-making. I like the idea of adding that flavor, though. Maybe make a small batch to see if it works out before embarking on a full quart? Frances: Yes, without knowing the exact place, usually the place where you put bread to rise would be a good temperature for yogurt. i’m the guilty party who made the suggestion. i’ve been making at least a gallon of plain yogurt once a week for several years now. being a super cheapskate i can’t stand paying the 900% mark up they usually put onto those little pots of yogurt. in the us you can almost always find supermarket milk on sale for under $2/gallon. i have a tip on the incubation process. my temps are the same as yours, but for the incubation, i wrap the pot (i make a gallon at a time) in a large towel and then put it inside a thermal sleeping bag which i fold over it a few times to maximize the insulation. it takes only 4 to 5 hours to form. since i like to minimize the tartness, i try to catch it just as soon as it’s formed, pour off whatever whey has accumulated on top, then refrigerate it for a few hours so it can firm up some more. then because i like the greek yogurt texture, i strain it for a few hours more in the fridge. i use the whey for fermenting vegetables. since you live in paris, i’m assuming you have some sort of thermal coverlet you could use if you don’t have a sleeping bag. with this method the temp only drops about 10 degrees after 5 hours. it’s very efficient and much easier than fooling with water baths, pilot lights, or beer coolers filled with hot water. as for stirring the milk. having no patience, i just bite the bullet and stir the gallon of milk over high heat, reaching all over the bottom to avoid scorching. It takes 10 minutes of high-alert stirring. but i’m used to making a lot creme patissiere, so stirring is no big deal, especially since that’s the only work involved in yogurt making. The radiant heat works very well, as I put the jar in a corner under a counter and the temperature was nice and cozy. Milk here costs about €1,4 ($1.80)/quart or liter – about €5 ($6.50) per gallon. And a 4-pack of plain yogurt (4 pots, each 1/2 cup/125g) costs about .80 centimes ($1) so it’s not necessarily more economical (or maybe it is, but by the time I do the math, I could have made the yogurt!) and since milk comes in plastic bottle (which I don’t understand, since square packaging packs tighter on shelves and for transit, as there’s no wasted air space between the containers) I don’t know how much plastic is being saved or not, but it is a good way to make yogurt if you need a lot of it. For Joel L: For raw milk yogurt it’s okay to heat the milk to 110 degrees F. — the benefits of the raw milk will still be retained. I use Yogourmet as a starter because I’ve found it to be reliable. As Claire noted, you can’t use the previous batch as a starter indefinitely for regular pasteurized milk yogurt, and it’s even dicier for raw milk yogurt. I leave the yogurt in a pot overnight on my stovetop, which is always warm since my stove is an Aga. Raw milk makes a runnier yogurt, so if you want it thicker, strain it — Euro Cuisine makes a nice cotton bag with handles for this purpose. (Use the resulting whey in your next loaf of bread.) There are lots of websites which discuss making raw milk yogurt so you might want to check some of them out. Coincidentally, this appeared on one of my blogs this morning. We don’t have enough to worry about? One of my favorite dishes in France was my host mom’s homemade yogurt with a choice of vanilla bean sugar or homemade blackberry jam on top. She made it in a nifty blender with a cooking element and a yogurt attachment on top that she said was all the rage among French housewives. I still haven’t figured out what it was! Yes, organic, unflavored, whole milk yoghurt is hard to find. I finally grabbed a quart of organicStrauss Family Farms Vanilla in frustration and got it home to find it has 32 grams of sugar per cup! I’m cutting it with a 2% plain and will start making my own, thank you. i hate to sound all martha stewarty here but working yogurt making into your weekly cooking regimen is a good thing, especially since it requires so little effort. where i live the little danon yogurts cost about 11 cents/oz. i usually get a gallon of milk for about 1.80. which means, if you don’t pour off any whey, your homemade yogurt comes in at close to 1 to 1.5 cent/oz. a considerable savings, for almost no work at all. and the taste of just set fresh yogurt is a culinary delight. btw. today’s an incredible day for equality in france after 6 months of such non-stop ugliness. i wish i were in france today. i’d certainly be down in montpellier. Thanks, again, for all the help. I’m sure I can get rid of the ropiness with all the suggestions I’ve received. I love my “thin” yogurt which I find creamy but not thick, and with a delicacy akin to a good crème caramel. Now that rhubarb is here, I’m in heaven. Thanks so much for the microwave encouragement, Cosgrove. Your 18 minute estimate helps, especially as I have a little, old microwave. If I got to 15 minutes of heating and checking and heating and checking I’d likely despair of ever getting to temperature. I’ll stop for fresh milk on my way home from work and zap it tonight. I have Voskos brand greek yogurt for my starter – no pectin or gelatin, just milk and lots of live cultures. I love Voskos, but I don’t like all those plastic containers and lids. Joan — OK! At the risk of TMI, a couple of other points about using the wave to best advantage: 1) I agree with Seth that higher initial heating makes for a better texture, and also (in principle) with those who like to simmer the milk for a while. You can’t simmer it in the microwave, but in fact you don’t have to. In my wave, 18 minutes takes the milk to about 200 degrees, and if I just leave it in there after the timer has turned it off, it remains above 180 all by itself for a nice little chunk of time. 2) Also, do yourself the favor of timing approximately how long it takes your usual quantity of milk to cool when you leave it untouched in the oven. (A thermometer with a probe is helpful for this.) If you know that it takes an hour to get to inoculation temperature, you don’t have to give it a thought between the moment you turn it on to heat and the moment when you put the starter in. Obviously this isn’t completely invariable — cooling time will depend on the ambient temperature — but it’s pretty reliable when the milk is left in the warm microwave, and the inoculation temperature itself is flexible enough to give you some leeway. For me, I know that I have about an hour and twenty minutes of total freedom before I have to check the temperature and put the starter in. At worst there’s five minutes or so of monitoring time. I’m a micro-skeptic, but the wave makes yogurt-making so much easier that I’ve stopped resenting the counter space that it takes up. Also, a note to Susan. Since no one else has mentioned it, let me just say that it’s very easy to control the tanginess of homemade yogurt. If you chill it as soon as the yogurt has “set up,” you will find that it is not sour at all. People who enjoy sourness like to let it culture longer, but you don’t have to. You can chill it while it is still milky and sweet-tasting. There’s a real difference between sourness and the intrinsic yogurt flavor, and you can easily keep the two separate when you make it yourself. Then if you want to sweeten it later you can, but you might not feel the need. My Mum (84) has been making yogurt like this for as long as I remember. She brings it to the boil, simmers for a few minutes and then leaves it to cool. Then she just dips her finger in to gauge the temperature. It really is not complicated as you have shown. I’ve tried it with soya milk in the past and it was fine – the milk had to be warmer I seem to remember for it to set and the culture had to be milk yogurt (I think). I have been making yogurt for several years now, I make a couple of litres every week. I have developed my technique by trial and error. I use UHT (long life) organic milk and add milk powder in order to make a thicker yogurt. I warm the 2 litres of milk to 50 degrees centigrade and in a separate jug I mix 2 tablespoons of yogurt from previous culture, 150 grms dried milk powder and together with another cup of cold milk. I then whisk altogether well and then transfer to jars which I then place in my dehydrator tray set at a fairly low heat and covered with a cloth ( not covered completely – leave a gap) it is ready usually in 3-4 hours. I get a lovely thick yogurt with a custard like texture. Your yogurt will be better if you use less starter–I use max 3 T. for a half-gallon. If you want to keep a starter going for any length of time, use less than you are currently using. We make 2 kinds of yogurt in our household–non-fat (1/2 gallon, enriched with ca 1/2 c. non-fat milk powder–organic, non-instant), and 1-2% depending on what’s available from our weekly dairy delivery (same proportions). With the enrichment, it’s incredibly good, and it also makes fabulous drained yogurt products (we do a lot of Turkish cooking for which this is invaluable). Whole milk yogurt is very uncuous, but if you are 60 yrs old and watching your diet, this is one way to cut without much noticing. Cosgrove’s – Thanks for the additional ‘wave suggestions. I am too late from the office to make yogurt tonight but I’ll definitely do it tomorrow. Love the idea of a yogurt schedule. It’s like making yeasted bread – a little work and then rest (or play). Then the payoff! I’m totally addicted to Vietnamese yogurt these days. It’s what some other commenters have made described: yogurt made with sweetened condensed milk. Not too sweet with a lovely tang. I’m a Viet gal and have only started making and eating this in the last few years. We weren’t a big dairy family when I was growing up. So I’m trying to make up for lost time. Thanks for the great prompt to make some yogurt again after decades! I found this nifty wide mouth insulated jar: http://www.target.com/p/thermos-stnless-micro-food-jar-12-oz/-/A-14386233#prodSlot=medium_1_28 It will make 12oz. which is enough for me for a couple days which means I’m sure I’ll use it before it gets too tart. I simply prepared and inoculated the milk and poured it into the container. I put the container in the microwave (a convenient insulated box which also makes a great proofing box so long as you put on a sticky note warning all and sundry that you kill them if they turn it on). Done! When it had fermented I put a paper coffee filter over it and turned it upside down into a flat bottomed coffee filter basket which was in a small cup. I returned that tiny tower to the fridge. After several hours I uprighted it and put the lid back on my thicker, Greek-style yogurt. But first I took off a couple tablespoons to start the next batch. I’m using the whey I poured off in some sourdough English muffin bread I’m making later today. Tomorrow I’m making more yogurt. instead of pouring hot water to disinfect jars, i bake them on a tray @ 350F for 20min. i also boil all the lids, funnel, and utensils at the same time. once the jars are filled, the oven has reached the perfect temp for storage. my yogurt is good for a long time if i don’t open it. straining the milk mixture before filling jars will help to get a silky texture. Hi David, I’ve been making my own yogurt for years, mainly because it’s been so hard to find thick yogurts here in the Philippines. Greek-style have just entered the market, but a 200-gram tub is so expensive it costs more than a liter of whole milk. So it’s more practical to make some. I use carabao’s milk (Philippine water buffalo), which has the highest fat content, and results in very thick yogurts even without draining. I’ve seen those five-cup yogurt makers, but I just dump the milk-culture into my thick-sided pressure cooker and wrap it thickly with several towels to keep the warmth. I make yogurt in the morning so the heat of the day helps in the fermentation.In the evening I get viscous yogurt, which I refrigerate for a cold breakfast the following day with fruit and cereals. My kids love it with mini marshmallows and candy rainbow sprinkles. Dear David, as a master baker, I presume you have made French yoghourt cake – a simple homemade cake, but with a nice tart touch, and great for adding sliced citrus fruit. The recipe I has substitutes almond powder for quite a bit of the wheat flour. http://lacuisinedagnes.com/?p=3151 Personally, I’d make this with olive oil, (not an expensive or assertive dark-green variety though) but do as you please, including butter! sorry, david. looks like i created a monster. i bet you’ve never received so much advice at one time in your life. We make yogurt once a week and eat it with your awesome granola recipe (which we also make every week with all kinds of variations). We were actually inspired after visiting Paris and getting freshly scooped yogurt from the cheese shop near our hotel for our breakfast every morning at Fromagerie La Ferme de PLaisance 2657 Rue Delambre, 75014 Paris, France. My baby loves plain yogurt! I use this method to make it for her every week, except I use a crock pot. I have the timing down so I know how long it takes to heat up and cool down. Yum! My mum made our yoghurt at home when I was growing up. She improvised a yoghurt-maker by putting an empty ice cream bucket in an insulated bag, then she put the jar of milk-mixture in the bucket and half-filled it with warm water and zipped up the bag. It worked beautifully, and the yogurt was so mild-flavoured and tender and delicious. I have a question, what happens when I add organic goat milk yogurt to cow milk? I would like to make some goat milk yougurt but I have no goat milk on hand. I know, but I love goat cheese and yogurt. Nada: I don’t know. But you should give it a try and see what happens, and let us know. I would imagine since it’s the same culture (perhaps?) it’d work fine. I love plain unsweetened yogurt – I think I was converted to it we went on holiday in France and stayed in a farm house and they served some fresh yogurt which I literally could not stop eating! I made my own yogurt for a while but I could never get it to set hard enough….should really give it another try soon! If you ever come back to the Bay Area again, try the Saint Benoît yogurt, if you haven’t already. They come in cute ceramic pots or Mason jars, and it’s made in Sonoma by a guy from France, partnered with local dairy farms. The yogurt is so rich. Last I tried them several years ago, I was able to turn in my ceramic pots for a discount on future purchases (at the Farmer’s Market at the Ferry Building). Anyway, it was hard to save some of this yogurt to use as a starter for my own yogurt (with Straus Family non-homogenized milk). But it was the best homemade yogurt I ever made. For everyday use, I didn’t bother heating up the (ultra-pasteurized) milk before mixing it up with yogurt to put in my Salton — it took longer to thicken up, but it was still good. I think ultra-pasteurized milk is the same as UHT? But we Americans are so used to refrigerating it. I have since discovered kefir and have been making that instead (because it takes less than 5 minutes, and no heating or extra equipment needed). Sarah — can you give some details of your thickening technique? It looks like you don’t drain the yogurt, but you use cloths to mop the whey off from the top of the dish. Is that right? Yes, you are correct. I just put a layer of paper towels on top of the fresh yogurt, and then a clean dish towel on top of that, and then a plate on top of everything. Just store it in the refrigerator and keep wringing out the towel every couple of hours, until it is the thickness you would like! Wow, Sarah. This technique could solve my biggest (only) yogurt problem. I can only make a half-gallon at a time, because nothing big enough to strain more than that will fit in my fridge. But does it really reach Greek-type density? And doesn’t it take forever? Do you mix it up at all between wring-outs to release the whey? Thanks! Yup, I checked out your blog post before asking my questions. Gonna do it next time for sure. Never seen this anywhere else. Really cool! Hi, I’ve recently been making labneh (inspired by your Lebanon posts) and it’s been delicious! Sometime I’m going to try making my own yogurt. I absolutely loved all of your posts on your trip to Lebanon – it really made me want to visit there someday. But in the meantime, I will have to satisfy myself with experimenting with some dishes. By the way, I would love to have you visit Thailand and to see our food through your eyes!! Outstanding results. I used 2% milk but it was not ultrapasteurized. It is not possible in Ann Arbor to get organic milk that is not ultrapasteurized. I guess it is trade off that is worth it– keeping the bacteria that would be killed vs. organic milk. Your friends at Zingermans use the same milk at their creamery. Thanks for this post David! I need to get back to making my own yogurt. I actually use the Easi-yo contraption without actually using their mix because it has as a weird aftertaste. I boil water, fill the easi-yo container with the boiling water, while my whole milk is simmering on a sauce pan until it reaches the right temp, then I let it cool and add a small container of natural yogurt. I pour it in the smaller easiyo container and seal it and leave for 8-12 hours inside the bigger container with hot water. The bigger easi-yo container acts as a thermos and keeps an even heat for several hours. When I wake up I have a very tart yogurt. I’m glad to be able to control the sugar in it as well as control the flavors. In India yogurt is part of most meals. It is very easy to make. 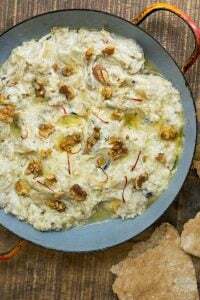 it can be made with all type of milk cow, goat etc and any percentage of fat – but that also means taste and consistency will differ.more fat means thick n good youghart and low fat means it will not set very well will be runny. sometimes I use milk from which i have skimmed off the fat once. sometimes I use whole fat milk. most times I use earthen pot but steel containers also work well. the milk has to be lukewarm – i just dip my finger in it to check if its luke warm or not.. heat it in microwave or on gas then pour into the container add a spoon or two of youghart, mix well. cover and keep for 3-4 hrs. then check if set. if too wobbly cover n keep for more time. then reintegrate for 2 hrs for it to set well. In cold months (or places) heat milk slightly more hot than lukewarm. keep in warm place . I cover my container with an old woolen sweater of my son. Time it takes to set might increase slightly in winter. You can also wrap your yogurt container in a heating blanket set on the lowest tempeture. I make my own yogurt already a few years. 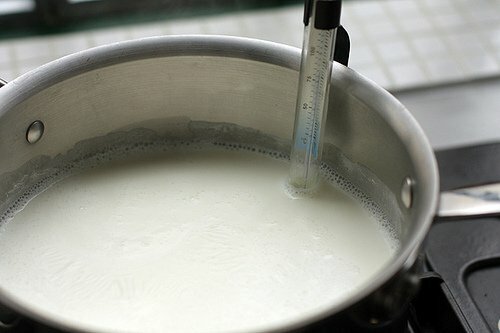 According with experience and knowledge of food microbiology – it’s enough to heat the milk to 45C and, if yogurt maintained at 42 ° C – it is ready, and after 6 hours and after this exposition time – possible to put into the fridge (with smooth taste, without excessive sourness)). and I ‘m very satisfied from this starter. Instead of fresh berries, which we haven’t here , I used freeze-dried fruit powders. Cosgrove’s – Thanks again for the microwave tips. Your timing and my timing are very close. I set up the makings on Sunday evening and on Monday morning had four lovely half pints of tangy rich yoghurt. Just in time for peaches! Rainey – Thanks for the idea of straining the yogurt in small containers with coffee filters. I’ve always used the coffee filters in larger colander requiring re-arranging my refrigerator contents and messy repackaging. The little towers worked beautifully! David, I’ve recently started following your posts and as much as I love all of the content you put up, I have to say this post struck a cord with me. I recently came back from Paris, and although it wasn’t my first time there, it was my first time that I actually went grocery shopping there, since I was staying in a rental apartment. 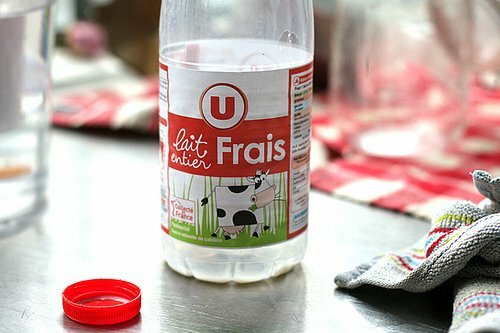 I picked up milk from the store by the name of Candia grand lait frais, and I was pleasantly surprised when I drank it. I’m not a big milk person, as in I don’t pour myself a glass of milk to drink unless its got chocolate in it or chocolate chip cookies beside it. But this milk was so creamy, and so very delicious. I honestly couldn’t believe how fresh and authentic it was. Now I know why I don’t drink milk in the states…it’s not real milk here! You are right indeed that French dairy aisles are a sight to behold…and bow down to! David, I have not yet made homemade yogurt, as there are many good brands where i live, but now I must try this. I’ve been wanting to. Heck, I am always “in” for making anything you can homemade. It is always better. What is fun about your posts is that so m any of your readers take time to post their thoughts and experiences. Great info and reading! Hard to believe 2/12 years since we met in Cancun. Whenever we use a color checker for photography I think of you! Memories are so funny. Janele…those cute Saint Benoit jars or mason jars of yogurt can be purchased at Whole Food Stores. If you return the empty mason jars to Whole Foods you will be refunded $1.50. This yogurt is the next best thing to making your own–absolutely delicious….. Thanks for the great nudge toward yogurtmaking David! 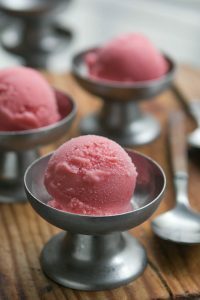 I’ve made three batches since you posted this recipe, including a batch of maple vanilla yogurt that probably won’t last long…My fiance and I got your book The Perfect Scoop and we love it. We’ve been making your recipes and experimenting for the past 2 years and always have fun flavors of home-made ice cream in our house. So, after these successes with yogurt I am wondering: is it possible to make an egg custard like you would for ice cream batter and then culture it like you would to make yogurt? I can imagine this making a deliciously rich and flavorful yogurt…but I can also imagine it going poorly and having a terrible texture or, worse, being contaminated with salmonella or other bacteria from the hours near body temperature. Have you ever tried something like this or heard of others doing it? Does anyone have an idea about whether this is a great or terrible idea? Thanks! You would be amazed to learn that in India, yogurts, especially homemade yogurts are made on a daily basis across households. Mainly because the temperatures are hotter and it acts as cooler meal component. Homemade yogurts are offen well stirred or whipped to get a buttery drink called “Lassi”. To add flavour, we may add sugar, black salt, dried peppermint leaves, or even safron. They are served chilled. All these adders give a soothing effect. So all followers, do try out this lovely drink – “Lassi” made from home made yogurt. I started making yogurt regularly when I inherited my grandmother’s yogurt-maker with all the little cups you describe, but my results have been uneven, and I’ve already manged to break 2 of the cups. I tried Seth’s method above: heating it up to 190 for a few minutes first, and then mixing in the starter at 120, and putting the covered pot in the oven with just the pilot light overnight, and it came out amazingly thick and yummy! Best batch ever, no straining involved, and simpler than using that little plastic warmer and the cups. BelleD- Thanks for the suggestion of adding condensed milk. I added a tablespoon or so to 12oz of hot milk with the culture and about a tablespoon of dried milk powder and what I got is silky, firm and the tiniest most luscious bit sweet. I just had some with sliced strawberries — nothing more — and it’s like a wonderful, light, desserty perfection. Joan- So glad the “little towers” worked for you too. But Belle’s Vietnamese style yogurt has such lovely texture I didn’t even need to do the straining with this batch. I left the yogurt to yogurtify overnight, then forgot it to put it in the fridge! So it was doing its thing for 18 hours instead of 12. Will it have gone bad, or simply very tart? I think it will be okay. I have done that before and it is fine!! It should be okay – just more fermented and stronger-tasting. But if you are suspect or it has any off-odors, you may want to start again.